It’s fully integrated in the WebKit loading process, sharing some logic with the memory cache too. It’s more efficient in terms of speed (the cache is in the NetworkProcess, but only the file descriptor is sent to the Web Process that mmaps the file) and disk usage (resource body and headers are stored in separate files in disk, using hard links for the body so that difference resources with the exactly same contents are only stored once). It’s also more robust thanks to the lack of index. The synchronization between the index and the actual contents has always been a headache in SoupCache, with many resources leaked in disk, resources that are cache twice, etc. The new disk cache is only used by the Network Process, so in case of using the shared secondary process model the SoupCache will still be used in the Web Process. This was one the few regressions we still had compared to WebKit1. When we switched to WebKit2 we lost IndexedDB support, but It’s now back in 2.10. It uses its own new process, the DatabaseProcess, to perform all database operations. WebKitGTK+ 2.8 improved the overall performance thanks to the use of the bmalloc memory allocator. In 2.10 the overall performance has also improved, this time thanks to a new implementation of the locking primitives. All uses of mutex/condition have been replaced by a new implementation. You can see more details in the email Filip sent to webkit-dev or in the so detailed commit messages. It’s more and more common to use the web browser to watch large videos in fullscreen mode, and quite annoying when the screen saver decides to “save” your screen every x minutes during the whole video. WebKitGTK+ 2.10 uses the Freedesktop.org ScreenSaver DBus service to inhibit the screen saver while a video is playing in fullscreen mode. WebKit’s font matching algorithm has improved, and now allows replacing fonts with metric-compatible equivalents. For example, sites that specify Arial will now get Liberation Sans, rather than your system’s default sans font (usually DejaVu). This makes text appear better on many pages, since some fonts require more space than others. The new algorithm is based on code from Skia that we expect will be used by Chrome in the future. The poor downscaling quality of cairo/pixman is a well known issue that was finally fixed in Cairo 1.14, however we were not taking advantage of it in WebKit even when using a recent enough version of cairo. The reason is that we were using CAIRO_FILTER_BILINEAR filter that was not affected by the cairo changes. So, we just switched to use CAIRO_FILTER_GOOD, that will use the BILINEAR filter in previous versions of Cairo (keeping the backwards compatibility), and a box filter for downscaling in newer versions. This drastically improves the image quality of downscaled images with a minim impact in performance. The lack of editor capabilities from the API point of view was blocking the migration to WebKit2 for some applications like Evolution. In 2.10 we have started to add the required API to ensure not only that the migration is possible for any application using a WebView in editable mode, but also that it will be more convenient to use. So, for example, to monitor the state of the editor associated to a WebView, 2.10 provides a new class WebKitEditorState, that for now allows to monitor the typing attributestyping attributes. 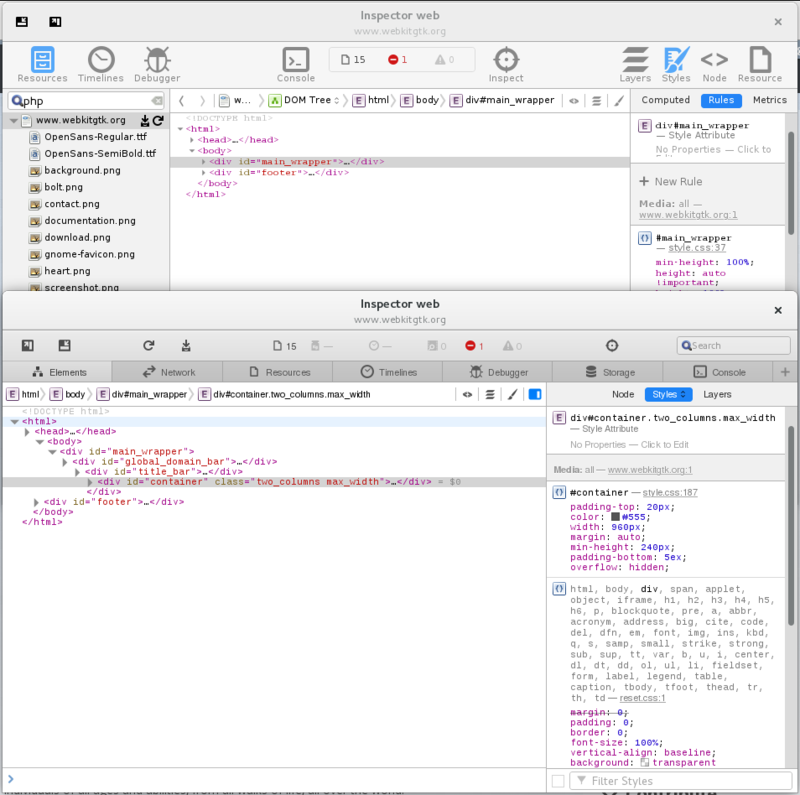 With WebKit1 you had to connect to the selection-changed signal and use the DOM bindings API to manually query the typing attributes. This is quite useful for updating the state of the editing buttons in the editor toolbar, for example. You just need to connect to WebKitEditorState::notify::typying-attributes and update the UI accordingly. For now typing attributes is the only thing you can monitor from the UI process API, but we will add more information when needed like the current cursor position, for example. Having WebKitEditorState doesn’t mean we don’t need a selection-changed signal that we can monitor to query the DOM ourselves. But since in WebKit2 the DOM lives in the Web Process, the selection-changed signal has been added to the Web Extensions API. 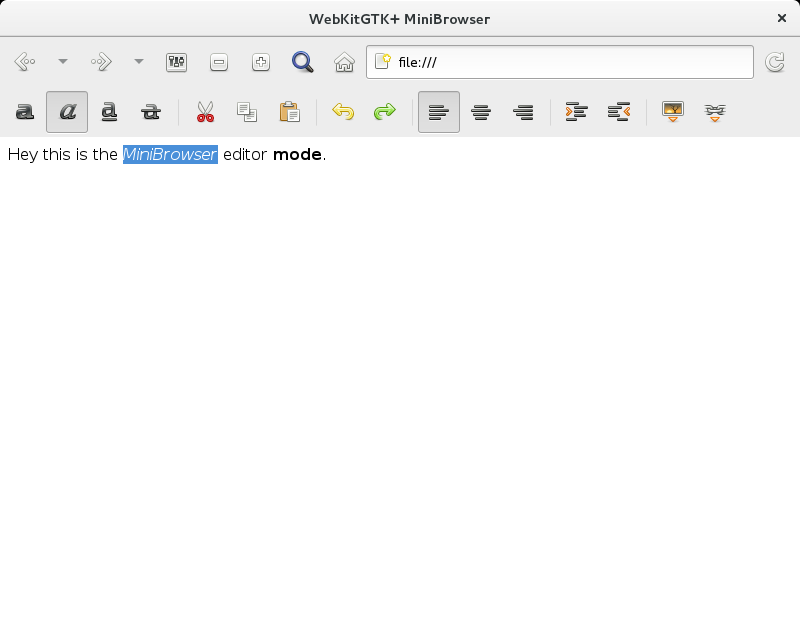 A new class WebKitWebEditor has been added, to represent the web editor associated to a WebKitWebPage, and can be obtained with webkit_web_page_get_editor(). And is this new class the one providing the selection-changed signal. So, you can connect to the signal and use the DOM API the same way it was done in WebKit1. Some of the editor commands require an argument, like for example, the command to insert an image requires the image source URL. 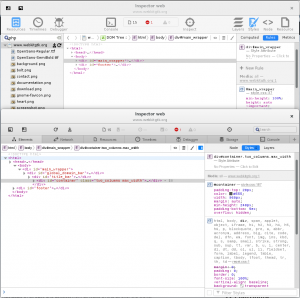 But both the WebKit1 and WebKit2 APIs only provided methods to run editor commands without any argument. This means that, once again, to implement something like insert-image or insert link, you had to use the DOM bindings to create and insert the new elements in the correct place. WebKitGTK+ 2.10 provides webkit_web_view_execute_editing_command_with_argument() to make this a lot more convenient. You can test all this features using the new editor mode of MiniBrowser, simply run it with -e command line option and no arguments. When browsing the web, websites are allowed to store data at the client side. It could be a cache, like the HTTP disk cache, or data required by web features like offline applications, local storage, IndexedDB, WebSQL, etc. All that data is currently stored in different directories and not all of those could be configured by the user. The new WebKitWebsiteDataManager class in 2.10 allows you to configure all those directories, either using a common base cache/data directory or providing a specific directory for every kind of data stored. It’s not mandatory to use it though, the default values are compatible with the ones previously used. This gives the user more control over the browsing data stored in the client side, but in the future versions we plan to add support for actually handling the data, so that you will be able to query and delete the data stored by a particular security domain. WebKitGTK+ currently supports two process models, the single shared secondary process and the multiple secondary processes. When using the latter, a new web process is created for every new web view. When there are a lot of web views created at the same time, the resources required to create all those processes could be too much in some systems. To improve that a bit 2.10 adds webkit_web_context_set_web_process_count_limit(), to set the maximum number of web process that can be created a the same time. This new API can also be used to implement a slightly different version of the shared single process model. By using the multiple secondary process model with a limit of 1 web process, you still have a single shared web process, but using the multi-process mechanism, which means the network will happen in the Network Process, among other things. So, if you use the shared secondary process model in your application, unless your application only loads local resources, we recommend you to switch to multiple process model and use the limit to benefit from all the Network Process feature like the new disk cache, for example. Epiphany already does this for the secondary process model and web apps. When you try to play media, and the media backend doesn’t find the plugins/codecs required to play it, the missing plugin installation mechanism starts the package installer to allow the user to find and install the required plugins/codecs. This used to happen in the Web Process and without any way for the user to avoid it. 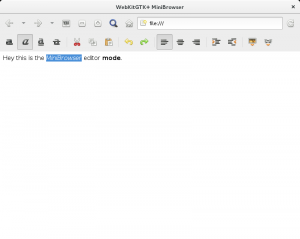 WebKitGTK+ 2.10 provides a new WebKitPermissionRequest implementation that allows the user to block the request and prevent the installer from being invoked. This entry was tagged epiphany, WebKit. Bookmark the permalink.